I live at Bottle Creek, Paremata on the Pauatahanui arm of Porirua Harbour, 30km north of our capital city Wellington. I spent my 20s working and travelling overseas, then worked as a lawyer for 25 years. Art was my weekend antidote for that. Now it’s full-time art. 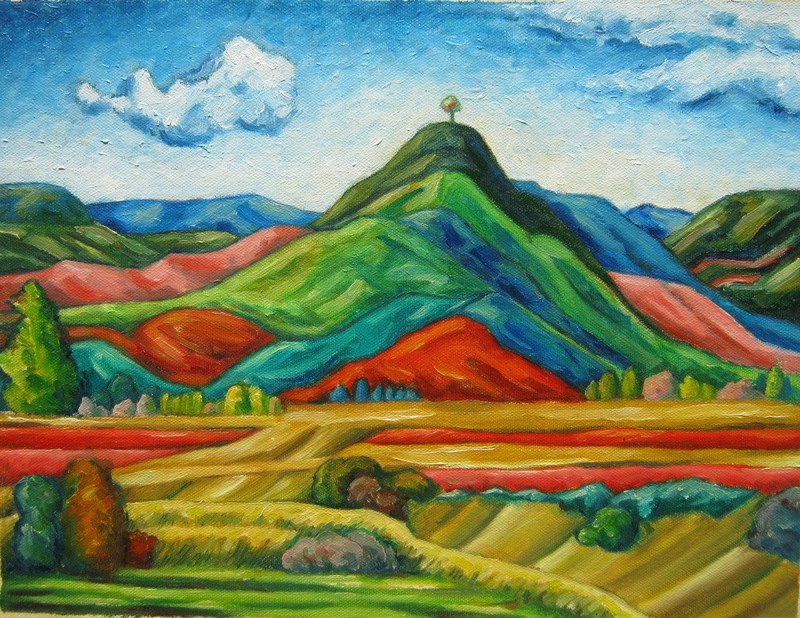 My work includes painting (oils and acrylics); illustration and cartooning; sculpting (wood, Oamaru stone, mixed media); and stained glass. We live in a continuous postcard here: most of the colours and shapes with few flat horizons – the land bossing the sky, visually at least. It’s a very young landscape too, the unborn earthquake/volcano god Ruamoko making his earth mother Papa “subject to geological change without notice” (Durrant) and his angry teenage brother Tawhiri forever wearing her down with wind and storm. It’s an invitation to move images around and intensify – as nature does. I got hooked on the ukiyo-e (woodblock prints) style via an exhibition of Ando Hiroshige’s fans at the Victoria & Albert Museum in London – bold flat expressive colours, clean line drawings and stories of another era and culture. 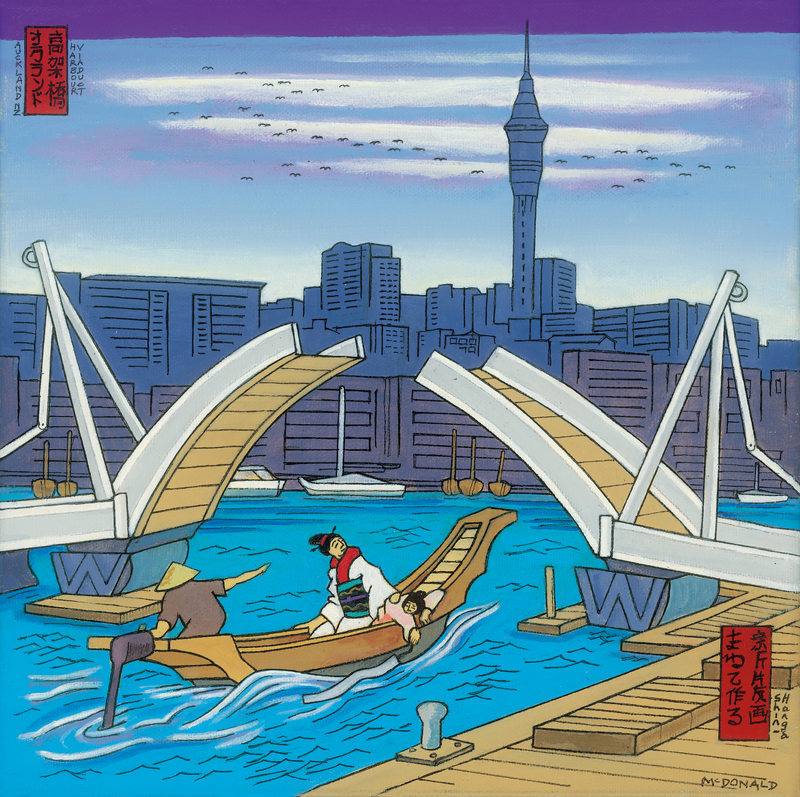 I have tried to imagine how Hiroshige (1797-1858) may have shown modern Wellington and Auckland urban scenes if he were alive today. During a period teaching law, I developed a problem solving model for lawyers involving choices of left or right brain thinking at stages of a process. However, practising law was mostly about analysis and communication. Making art involves problem solving too: first, getting the technical/archival side right and then letting the creative side loose, calculatedly or not. So, I can use that inter-change a lot more now. I like being open to mistakes and accidents – and being my own client. The stories are alive, doesn’t matter whose time or culture. I am one of the 10% of males (cf 1 in 256 females) who are red-green colour vision “deficient” where the reception of my red cones shifts (moderately) towards green. I can see a strong mid-red against a mid-green, but reds disappear within mixes (browns, violets or pinks) or when the red area is small. For example, I have to focus on shapes to see pohutukawa (crimson) flowers on the tree – the whole tree is initially dark green – but I do see rata (orange/red) flowers easily. Tree trunks are also green. – a challenge as to how to use that in my art. And there is no temptation to do “realism”, which is liberating. If interested, you could start with Colblindor http://www.colorblindness.com and /https://en.wikipedia.org/wiki/Color_blindness . Loved the paintings Alistair. They are technically very accomplished, they are fresh and the colours are vibrant and interesting. Keep up the good work. I would love to see them some time when I am in Wellington. I live in Nelson and am a friend of Lester Oakes. Thanks Peter, much appreciated. This site is just a couple of weeks old – I hope to load up more pix this weekend 1-3 June – 15 years of work to chose from! I’m so glad to see your web site established! Now others can see how creative you are! Wanted to find out if you sell your work? Love the great wave Titahi Bay number 10, as a local!